I've been reading so many articles in magazines about fall decor the last few weeks. I've been so resistant to the idea of decorating for fall because in my mind, as much as I love fall, fall means winter is right around the corner. I'm not a cold weather, snow on the ground kinda girl. I love to ski, but want the snow in the mountains, not in my yard. I love summer!!! Needless to say, the last thing I wanted to admit was the weather was changing and fall was right around the corner. The last few days here in Illinois have been chilly and fall-like, so it was time to embrace the changing of the seasons and stop living in denial. Either that or move to Texas (shhhh don't tell, but I kinda like that idea better!). I needed a new fall wreath for the front door, but I didn't want to buy anything to make one. I looked around my house for things I already had on hand. The one great thing about being a blogger, I always have craft stuff around and with enough thought I can usually figure out something to make with it all. I was in luck! I had a grapevine wreath I'd bought at Hobby Lobby after we moved into the new house, but hadn't gotten used it for anything yet. Now, I had a base for the wreath, but had to think about what I could do with it. I wanted the base of the wreath to be something I could change when Christmas came around. 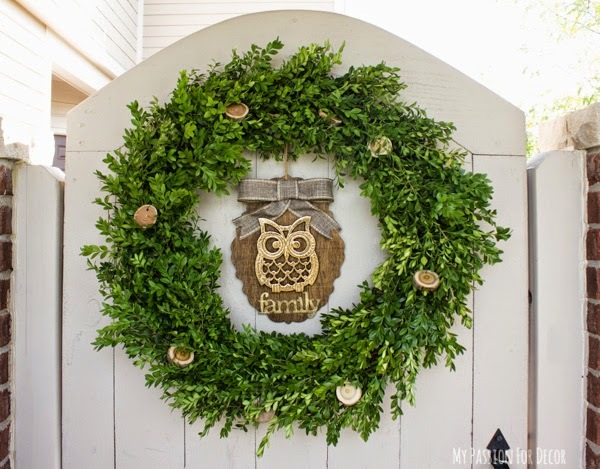 I did a bit of poking around on Pinterest and then it hit me....I have lots of boxwood bushes in the yard....why not make a boxwood wreath? I'd never tried this before, but really how hard could it be? The answer is not hard at all!! 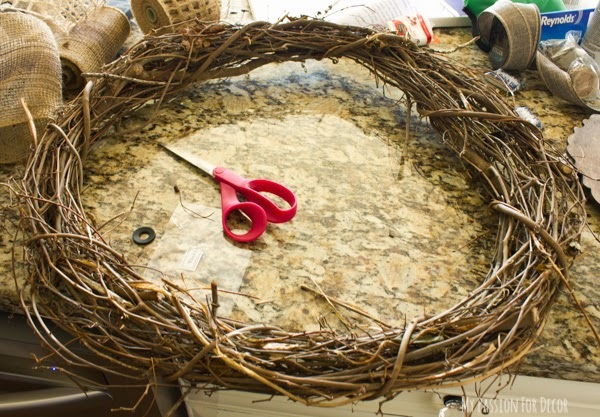 I started with this grapevine wreath form. I went out to the yard with some scissors and a Target bag and started cutting pieces off the boxwood bushes. When I had a full bag of boxwood cuttings, I plugged in the hot glue gun. I took one of the boxwood cuttings put a bit of hot glue on the end of the stem and stuck it into the wreath. I kept doing that until I had gone all the way around. I kept all the boxwood cuttings pointing the same way as I moved around the wreath. Right before the end I had to go back out and cut some more boxwood. I'd say I used about one and a half Target bags of boxwood cuttings. This is a large wreath form, about 24 inches in diameter. Once I went all the way around the wreath, I went back through and filled in the spots that looked a bit bare. Now I had a boxwood wreath! 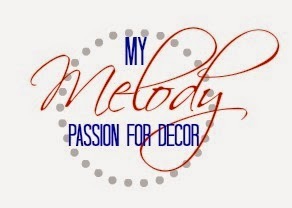 I thought about just leaving it the way it was and adding a nice burlap bow, but I wanted to do something more 'me'. 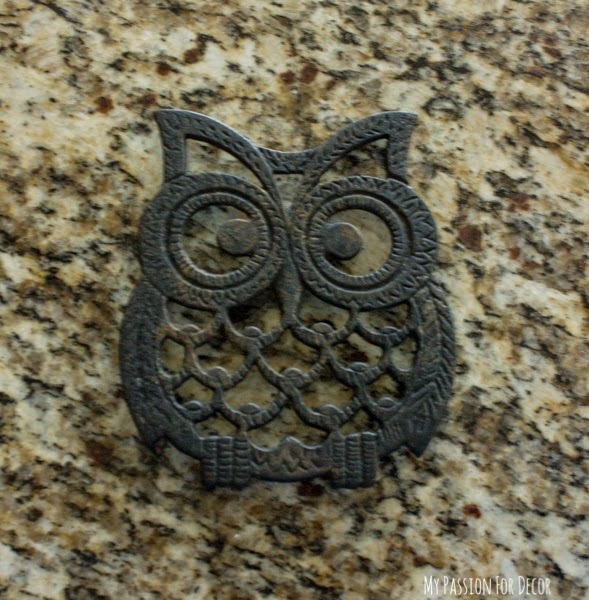 Last summer I went to a great estate sale and found a cool iron owl trivet and owl coasters. 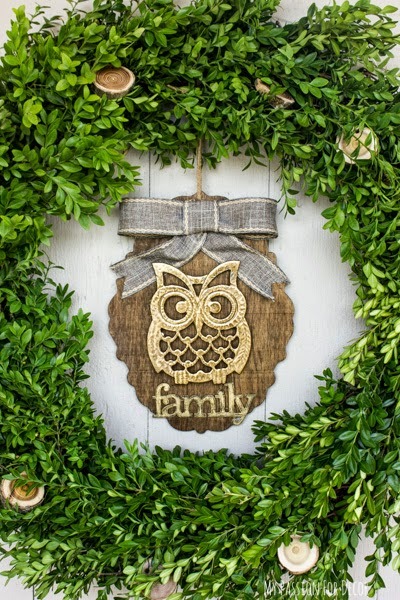 I thought it would be fun to add the owl trivet to the wreath somehow. I remembered I had a piece of curvy wood I bought at Michaels last year for a project I never started. I had stained the wood using some java gel stain, but that was as far as I'd gotten with the wood. Here's the owl trivet before. I liked the owl black, but I wanted to give it some WOW, so I sprayed it with gold spray paint. I loved how shiny it looked after it was sprayed! Next, I had to figure out how to attach the trivet to the wood and the wood to the wreath. I decided to drill small holes that matched up to the back of the 'legs' on the trivet. I wanted it to stand up off the wood. I didn't drill all the way through the wood, just enough for the trivet to sit into the wood a little, then used hot glue to attach the trivet legs onto the wood. I drilled a hole in the top of the wood, attached a bow and some jute string and hung it from the wreath. To add a bit more detail, I painted a wood 'Family' piece, I bought at Michaels, in black and gold and hot glued it underneath the owl. 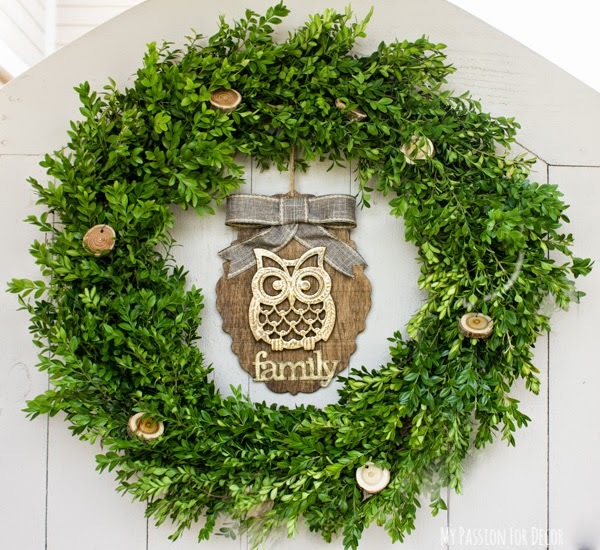 I hung the finished wood owl piece from the middle of the wreath with the jute string. I thought it needed something else! I had some small wood slices I had purchased at a flea market in the spring that I thought would look perfect on the wreath. 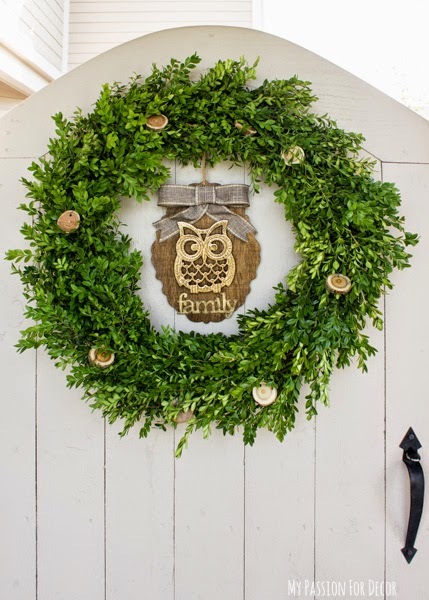 I drilled holes in the top of the wood slices, added a piece of wire and attached them to the wreath and I was done! 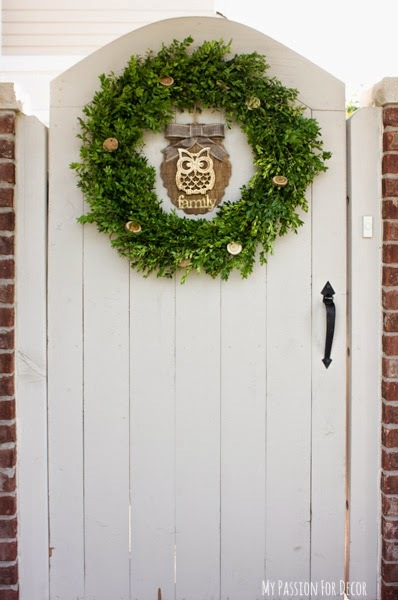 Here's my simple, fall wreath hanging on the front gate. I really like how it turned out! The best part? 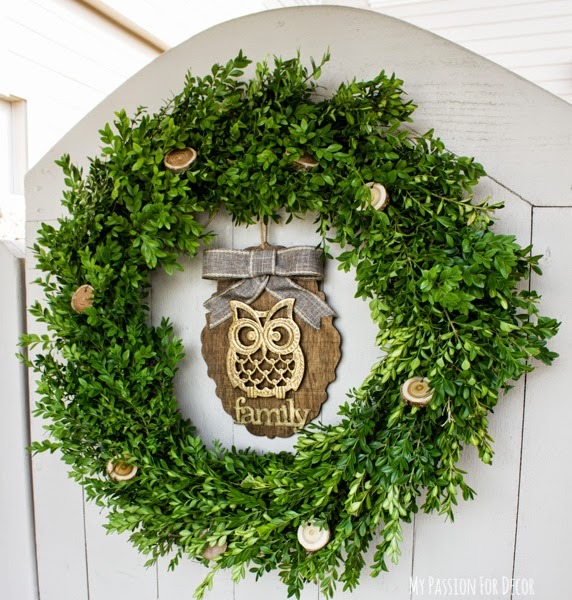 The only thing that's attached to the wreath permanently are the boxwood clippings. Everything else is wired or tied on, so when it comes time to change it up for the next holiday I can do that easily without damaging the boxwood. I'm loving the neutral colors and simplicity. All in the wreath cost about $15 to make. In my book that's a bargain for a boxwood wreath! 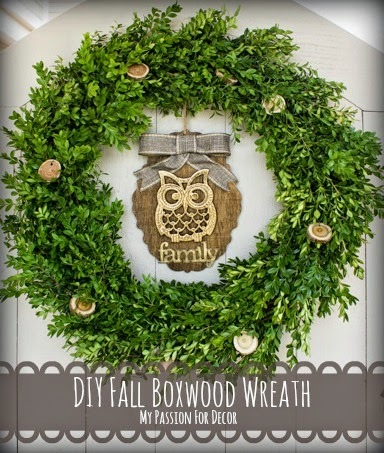 I've priced out boxwood wreaths and I've never seen one for that price! I might have made a fall wreath, but that doesn't mean I'm ready for fall! I haven't decorated inside yet, but I think I'll have to cave in and start that soon. I can't fight Mother Nature or the calendar or can I? How about you, do you love the fall? Have you decorated your home for fall? 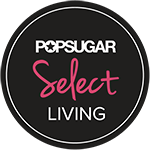 I'd love to hear what you're doing in your home! 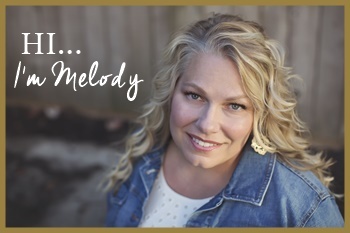 So pretty Mel! I love the owl! Looks great! How long do you think it will stay green? Ashley....that's a very good question! I'm hoping forever...LOL, but who knows? I'll keep you posted! 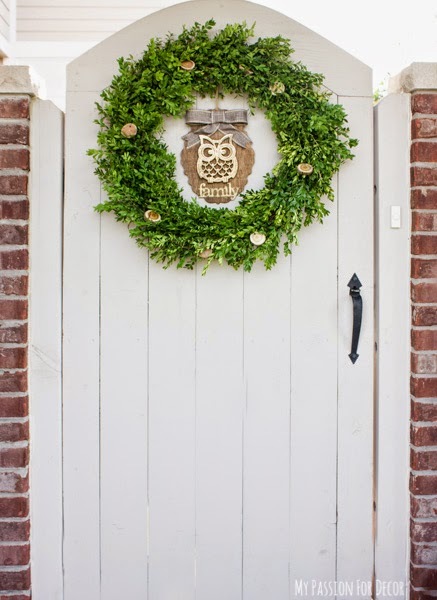 I love boxwood wreaths....how long will it last? Just wondering!